With its natural beauty and secluded rustic charm, it’s easy to see why Long Branch Farms is among the top country wedding venues in Northern California. Couples have been getting hitched here for so long that their significant anniversary parties are starting. The staff at Long Branch know weddings, and sweat details. Each wedding is as unique as the couple getting married and creative ideas for adding extra personal touches are readily shared. Whether you exchange vows in the picturesque country chapel or set up an altar in the meadow, the distinctive romance of an authentic, country western wedding will provide great memories for years to come. Throughout the property authentic artifacts and charming old western buildings make idyllic backdrops for your wedding photos. Half Moon Bay Wedding Film | Long Branch Saloon & Farms | Laura + Patrick from Van Hsieh/Ocean Blue Videography on Vimeo. The expansive grounds allow for a fairytale reception of up to 500 guests, or an intimate gathering of your closest friends. Dinner and dancing can take place outdoors under the stars or inside the Palace Grand Parlor. The original barn has been lovingly transformed into a charming old western saloon which will delight your guests as they belly up to the bar. The games and activities break the ice between guests so friends and family get to know each other. Life on the farm with the Palmer family has always included a menagerie of animals, so pets are welcome. Only one event is scheduled per day so you have the team’s undivided attention while you are here and any additional vendors you hire have time to go above and beyond for you. Weddings at Long Branch are magical and a perfect way to start your “happily ever after”. 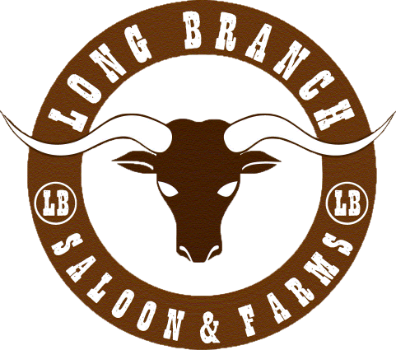 "I reserved Long Branch Saloon and Farms a year ago. From the beginning Lisa was amazing. Throughout the entire year all of our questions were answered in a timely manner. Layouts and vendors list were sent out as many times as I asked. The entire planning went so smooth. It was so smooth that I thought it may be too good to be true and something would go astray on the wedding day. But my wedding day was PERFECT!! BEYOND PERFECT!!! Lisa, Kevin and the entire staff were so professional but in a very chill and relaxed way. I got hitched without a hitch!!!! I would highly highly recommend Long Branch!!" Planning a wedding is not a trivial affair. Choosing the right color scheme, floral arrangements, catering, entertainment, and logistics takes time. Let us help you put together the package that makes the job of wedding planning a breeze. The staff at Long Branch Farms will work with you to create a custom wedding package that makes your wedding unique and special. We have the right connections to make sure that you get beautiful flowers, great place settings, excellent food, and great entertainment. Have a special request? Contact us to see what we can put together for you. Lene + Jorge | Highlight Reel from N Compass Cinema on Vimeo.